After joining California Closets in 2006 as Senior Vice President, Bill became the President and CEO in 2009. Since then, he’s led the expansion of our product lines to bring high-end Italian-made offerings to our clients, doubled the number of retail showrooms throughout North America so we can serve more communities, and launched computer-simulated design tools that allow customers to see virtual renditions of their reimagined spaces. 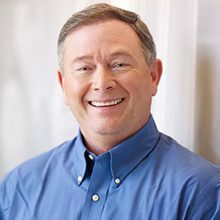 A successful executive and entrepreneur for more than 25 years, Bill has a range of industry experience that includes information technology, financial services, travel, health care, shipping, legal, distribution, real estate, e-commerce, and business process outsourcing. In 2012, he was recognized as a Wood Industry Market Leader by Woodworking Network magazine. Bill holds a Presidential/Key Executive MBA from Pepperdine University and completed continuing education programs at Harvard Business School and Stanford Business School.